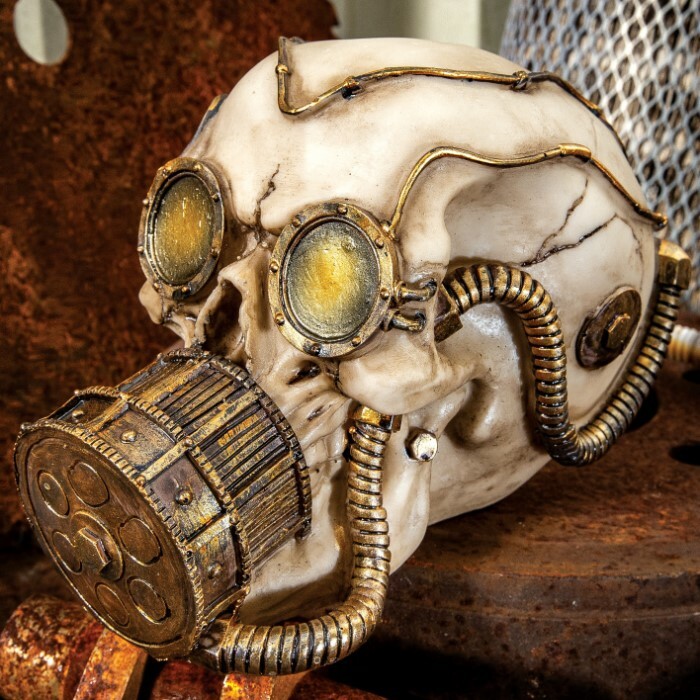 Magnificently unique, spectacularly quirky with an impeccable splash of “dark,” this beautifully crafted skull sculpture drips with hip steampunk style. The attention to detail is extraordinary, with realistic anatomical form and scale, authentic touches like skull joints and sinus cartilage and so much more! 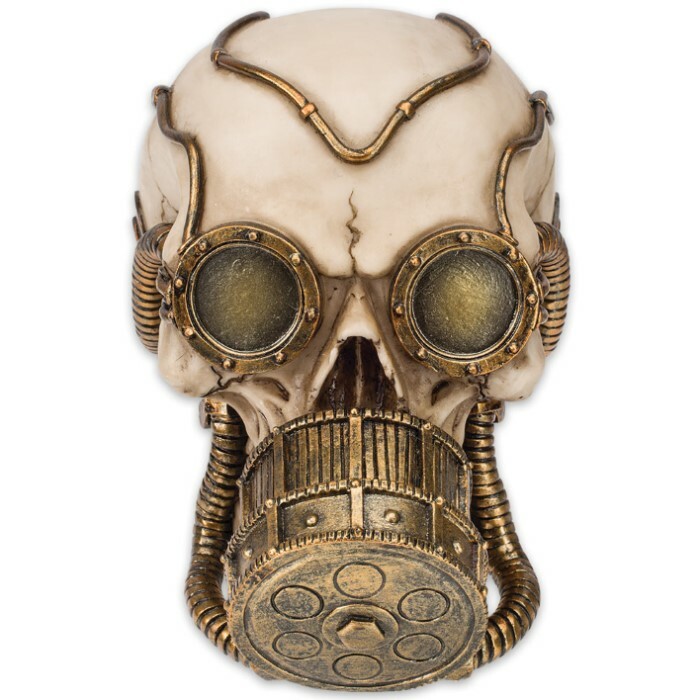 Made from tough cold cast resin, this awesome steampunk-style décor piece livens up any space in your home or office, and it’s sure to draw admiration and stimulate many a conversation. It also makes a fabulous gift! Like any new family member, before bringing “Mr. Chemskul” - as he’s affectionately dubbed – home, you should learn a bit about his background. His story is as follows: Undeniably brilliant but hopelessly mad, scientist/industrialist Volataire M. Chemskul spent his entire life toiling and tinkering amongst the blazing furnaces, steaming valves and grinding sprockets of his notorious alchemy lab - "the Vaporworks." Day after day he twisted dials, pulled levers and mixed various powders and potions - creating what? No one knew. Often he worked days on end without sleep, driven by a desperate fervor that went well beyond lunacy. Like a rabid dog he labored ceaselessly, locked inside the imposing gray walls of the Vaporworks - a veritable prison of his own design. Resting in the shadow of the Vaporworks is the tiny hamlet of Steamburg. For decades, the townspeople watched acrid steam clouds puff from the Vaporworks' towering smokestacks, yet no one ever witnessed a single soul enter or exit the hulking Vaporworks edifice. Unable to contain their curiosity and fearful suspicions any longer, the good citizens of Steamburg assembled a mob to investigate. When they finally infiltrated the Vaporworks' imposing frame, the party of inquisitors gasped in unified horror. Surely their eyes deceived them! 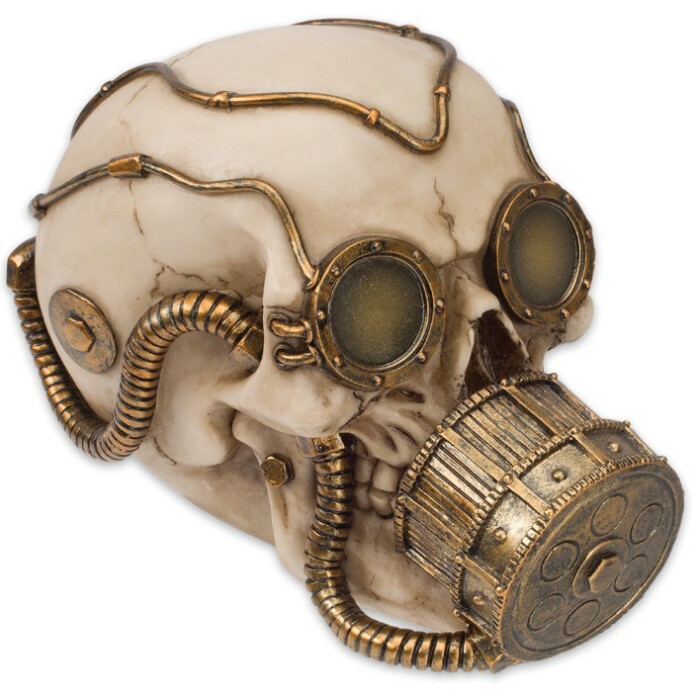 For standing before them, beneath a giant, vapor-belching contraption comprised of gears, dials, vents and mazes of gleaming pipes, was none other than Volataire Chemskul – his skin and flesh conspicuously missing, yet still donning his signature gold goggles and gas mask. Following decades of exposure to hazardous vapor, Chemskul's soft tissue had indeed melted away, and his soot-stained gold gas mask and goggles had fused to his naked cranium. But Chemskul refused to submit to the reaper, and even in death his bony skeleton continues to toil away at the Steamburg Vaporworks, building a mystery that generation after generation of townspeople have yet to discern. Volataire has become a legend, with the fine people of Steamburg declaring him "Warden of the Vaporworks." 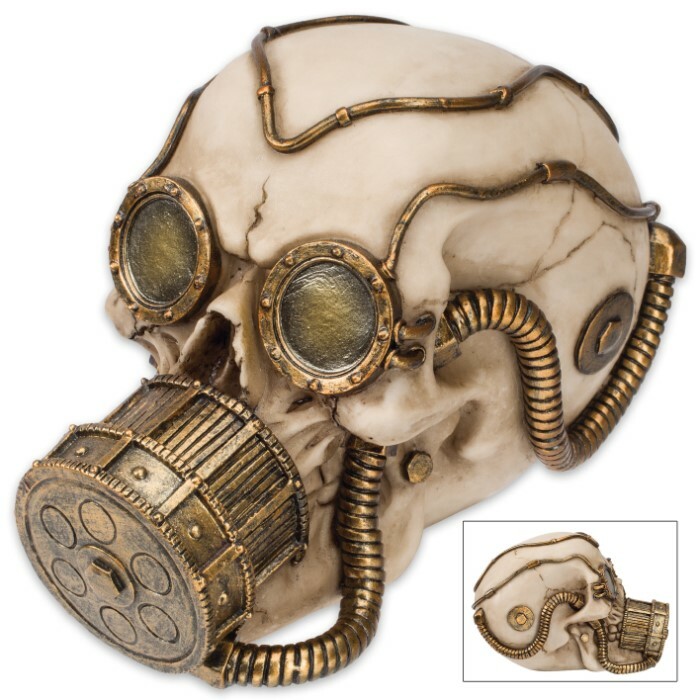 Honor the legend while dressing up your home or office in a cool steampunk motif - bring home Volataire M. Chemskul today!